Laterite. Image source: Dept. of Geology, of University of Maryland. Laterite is a residual red clay soil, usually soft and porous, consisting mainly of hydrated oxides of iron and aluminum. Some is used as iron ore. It is formed from various iron-containing parent rocks by a process known as laterization: secular weathering with powerful leaching out of silica, alkalis, and alkaline earths, under oxidizing conditions. 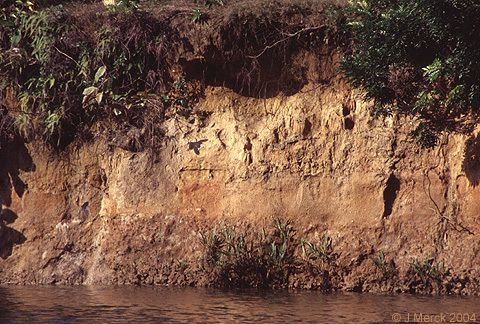 A tropical climate with frequent heavy seasonal rainfall and good drainage is required for its formation.